Fall is a busy but satisfying time of transition between the exuberant, chaotically busy green time of summer and the calmer, muffled white of winter. Though we relish the autumn for itself, we spend much of the time getting ready for winter. Many of the routines have become second nature and are not major chores, but they all help to make the cold months easier. Maybe you will find an idea or inspiration here to add a bit of healthy frosting to your own homestead winter life. LESSEN THE HEATING AREA -- Though our house isn’t large, we found we could save some firewood by blocking off the back third of the area. Because of the open design of our place, we can’t just close a door to shut off a room. 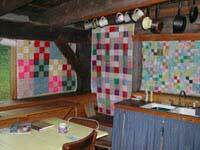 Instead, I would wash a pile of the best looking of the "garden blankets" and hang them behind the living room wall and across the open areas between the "front" rooms (living, office/library, kitchen, and shop) and the "back" rooms (bedroom, bathroom, storage room). We also put up a temporary, simple framed quilt covered door in an opening so we could easily get back and forth. For many people it is a simpler matter to shut off a few rooms. Though we assist our wood heat with two large solar heating panels on the front of the house, our main source of winter heat is our wood heating stove (plus the wood cookstove). These heating sources are in the front part of the house, so by blocking off the back, we kept much of the heat in front where we spend most of our time. While it did get cool in the back rooms, they weren’t so cut off that it was freezing back there. However, it was cool enough that we preferred to move our bed from the back bedroom to the living room. We used to simply make up the bed on the floor. Then Steve rebuilt our homemade couch so it could turn into a bed in a few minutes, thus becoming both bed and couch for the winter. It was a cozy and comfortable arrangement. An hour or so spent reorganizing our living space resulted in the savings of heating fuel. All it took was a willingness to look at the living areas from a different perspective, and play around with the possibilities. I enjoyed the winter coziness of this arrangement. But when I started working in watercolor my studio ended up in the back of the house. Though I didn't need a large area, there simply wasn’t a convenient spot in the front. And since I do most of my painting in the winter months, we could no longer block off the back of the house. We do burn a bit more wood, and I miss the atmosphere of our former compact winter arrangements. But having a painting studio for painting makes it worthwhile. CEILING FAN -- We make more use of fans in the winter than in the summer. Even though our ceiling isn’t that high, the use of a ceiling fan is a great help for winter comfort. Since hot air naturally rises, the fan sends that warmth back down to our level. We also occasionally use a set of small fans to direct the heat from the woodstove in a particular direction. Thus the areas we inhabit feel warmer without additional heat. If you have regular grid power, your choice of fans is plentiful. But since we wanted our fans to run directly off our 12 volt battery system, Steve assembled the fans himself. The ceiling fan is an industrial-grade computer tape drive motor mated to a fan blade assembly from a discarded box fan. The small fan set is a small rack of three old computer power supply fans, screwed to a base and wired with a switch and cord. We use similar fans in the greenhouse where they help keep things healthy by keeping the air circulating with very little use of power. WINDOW QUILTS -- These are in place year round so there really isn’t anything to do here to get ready (except for occasionally taking them down to wash them). When it is significantly colder outside than inside, we drop the roll-down hand-made window quilts at night. And when it is REALLY cold outside during the day (low sub zero’s), we leave most of them down during the day as well. On some windows, they also get used in the heat of summer (which is somewhat rare in our neck of the woods) to keep the sun and heat out. The difference the window quilts make is easily noticeable. OUTDOOR CHORES -- There are always many more outdoor projects on the list of "things to do before winter" than there are hours in the shortening days, but a few do manage to get done every year . . .
WINTER SALADS -- It’s nice to have a bit of green for both palate and psyche in the winter (and palette, too, if you are a painter!). Before the hard freezes set in, I dig up a few plants of the hardier sort to help us through those non-outdoor-gardening months. I transplant them into a waist-high raised bed in our attached greenhouse. You could also plant them into a large bucket or pot (with drain holes) and set them in the sunniest spot in your house. Experience will tell you what works best in your environment. I usually bring in hardy greens such as parsley, swiss chard, celery, herbs, and a flower or two. Since my greenhouse is unheated, I have to stick with the cold hardy plants. But if you have a warmer area, you could expand your trials to other plants such as peppers and small tomatoes. I usually also plant some lettuce and other salad greens the end of August just for the greenhouse. Planting needs to be timed so the plants will be pretty much full size before the cold weather and short days set in. Transplanted into pots or flats (or the bed) these supplement the other plants to provide us with fresh salads. Even a few fresh leaves makes a lot of difference in the depth of winter. You can also plant some later to take a flat or two of small seedlings through the winter. They will hibernate until the longer and warmer days of spring to provide welcome new green when things are still very brown outside. CAT SOD -- If you have cats, and your ground is covered with snow for an extended time, dig up a square of good grass sod to bring in for winter. Set in an old cake pan on a sunny windowsill, this is a favored winter spot for our outdoor loving felines (who don’t care much for snow). They will chew on the grass, roll in the hay (so to speak), and lounge with that feline specific abandon on this little patch of indoor sod. To say that it is a popular spot is an understatement. You can also plant a flat of grains (wheat, rye, barley, oats) for their winter grazing pleasure. It doesn’t stand up to much lounging, but it does give some good, fresh feline salads which they appreciate as much as we do ours. CHICKEN HAY -- When we had chickens, they also relished green in the winter. Since the regular growing kind was more than a little scarce for the many winter months, in the fall we would buy six bales of the best, freshest, greenest alfalfa hay that we could find. Then each month we would set a fresh bale in the coop, minus the twine, and let the chickens have a party. They would scratch, eat, toss, and spread the hay all over the coop. The smell was great (not something that can usually be said of chicken coops), the chickens happy, and the egg yolks a respectable dark yellow. It was well worth the bit of extra money it cost. WOOD ASHES -- If I haven’t already done so, I empty the designated galvanized garbage can of its supply of wood ashes before the snow comes, spreading them thinly on garden and fruit trees, in preparation for the coming intense "wood ash making" season. Storing the ashes in a can, instead of dumping them in a pile somewhere, allows me to put them where they can do the most good. Where a concentration of wood ash would be harmful, a thin sprinkling can be helpful. I never have enough for the entire garden and fruits, so I alternate sections and trees. Fresh wood ashes are also good to put around transplants and growing cole crops and along radish rows to prevent root maggots from moving in. GARDEN -- Since I have permanent, mulched beds in the garden, there isn’t much (other than harvesting) to readying the garden for winter. I might cut down the sturdier plants (such as broccoli, corn stalks, and asparagus) with the long handled lopers to help the decaying process along, but mostly I let nature take care of things. I do throw some extra mulch on the strawberries and asparagus. Not only does this protect them if we don’t get adequate snow cover until late (which happens occasionally), but it makes life easier in the spring. The asparagus just comes up through the mulch, and when things start perking up I pull the mulch off the strawberry plants. Then, with just a little weeding, these beds are all set for the new growing season. In early fall I plant cloves of the best bulbs of garlic, with the usual covering of mulch. I also plant some of the best of my onion bulbs to grow seed next year. The same with carrots and any other root crops. I also pile mulch on a patch of late carrots that will be overwintered for (hopefully) spring eating. It’s an iffy proposition here, but when they make it, the eating is great. If I don’t have extra hay stockpiled for the above purposes, I use the mulch from the paths. They won’t miss it over winter. It does, however, mean more weeding of the paths next spring until we get new hay mowed, raked, and spread. The best years, I have plenty of mulch hay for everything. If you buy your mulch hay, you can sometimes get a good deal in the fall from farmers who don’t want to store the hay over winter, or if it was rained on. Make sure they know you are using it for mulch, and that you don’t want hay with maturing seed heads. WOOL SKIRT -- For those never-ending (it seems) "quick" trips outside for this or that in the winter, that tend to end up longer than shorter, a long, wool wrap skirt can be a handy garment. It is faster and easier than changing into long-johns or struggling into snow pants or coveralls. Though there is no reason a man couldn’t make use of this as well, I assume women will be more interested. I sewed mine up from scraps (this is a funky working skirt, not a "wear to town" outfit) -- wool material on the outside, lined with flannel inside. It’s a simple wrap around design, with generous overlap, and a tie closure. Remember to size it to be worn over your regular clothing. Mid-calf length works well, keeping you fairly warm yet with plenty of striding room. For serious outdoor work, when you need to be agile, pants with long-johns under or coveralls or snowpants over are better. But for the quick and dirty, the skirt is great. This was my solution to our half mile walk to the car in the winter. Since I didn’t have snowpants, it was either be cold and not enjoy the walk, or be warm and wear long-johns. Then, either keep the long-johns on at the other end of the trip (usually uncomfortably warm), or do the gymnastics required to take them off in our (rather small) car. It may not win any fashion awards, but the wool over-skirt is much easier. SQUASH MEATLESS STUFFING DISH -- This isn’t really in the "getting ready for winter" vein, but it is the time of year we have winter squash to eat. Now I’m not much for fancy dishes, or anything that takes too much fussing or time to prepare. So I tend to come up with adaptations and meals that are easy and are based on food we have. This is what I do with winter squash. Cook your squash however you like (halved, or quartered, or peeled and cubed) in the oven, or in a covered pan with a little water on top of the stove. Since this time of year I’m cooking mainly on the wood heating stove, I usually go with the second option. Saute chopped onion and garlic in a little oil. Add some parsley and sage (or whatever seasonings you like). Add a pile of sturdy bread cubes. Saute a bit longer to toast the bread some. Stir in some yoghurt (or some water if you don’t have or want yoghurt) to bring it all together. Serve in the squash halves, or mix with the squash cubes. Or forget the squash and serve as a side-dish to something else. It’s good eating. NOW, sit back and enjoy the coming of winter. It’s worth all the preparation.